Study and Action Partner Kayla DeVault is an American Indian Science and Engineering Society (AISES) Sequoyah Fellow, Generation Indigenous Youth Ambassador, and a Board Member of the National Peace Academy. Her collective work, research and activism reside at the intersections of indigenous rights, environmental issues, and gender. As an AISES Sequoyah Fellow she focuses on renewable energy feasibility, energy efficiency, and tribal policy. She is especially interested in how to uplift traditional knowledge and promote sovereignty through the reformation of laws and structures that oversee activities on tribal lands. You can read Kayla’s full bio here. Gar Smith is a WBW Coordinating Committee member with a long history as a peace and environmental activist. He is the founding editor of Earth Island Journal and his writing has appeared in newspapers, online, and in magazines ranging from Mother Jones to Hustler. In 2003, he co-founded Environmentalists Against War and editor of The War and Environment Reader. The links between war and the destruction of the environment are overwhelming. Take a moment to discuss and create an inventory of war’s impact on the environment. In what ways do the preparations of and for war impact the environment? In what ways has the conduct of war destroyed the environment? What is the aftermath and lingering impacts of war on the environment? Which of these impacts are the most surprising? Troubling? Why? 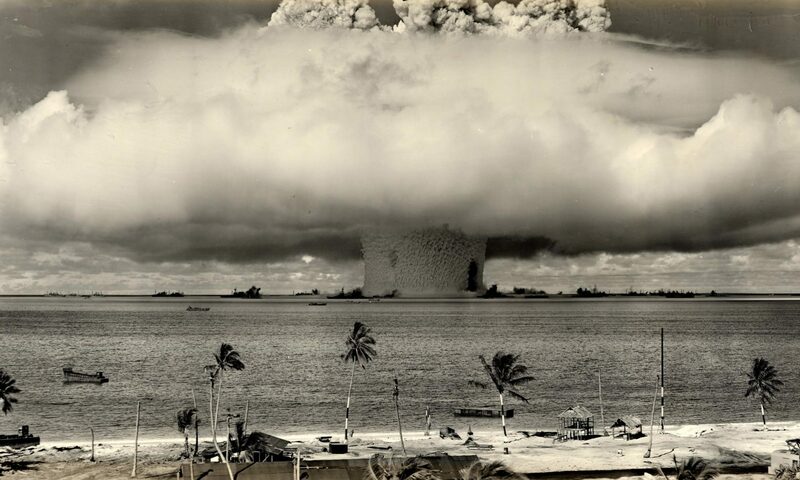 The environment is rarely given consideration in the preparation and conduct of war. While the Pentagon issues reports about the security implications of climate change, it doesn’t bother to examine how its own activities have contributed to the crisis. How might we go about challenging military and political leaders to see these links more clearly? All war is war on the environment. Gar Smith points out the vicious cycle of “war for oil and oil for war” (also well expressed in the illustration below). Could disrupting our dependency on fossil fuels be an effective strategy for disrupting the war system? What obstacles stand in our way and how might we organize to overcome them? In AGSS, World Beyond War proposes the development of a Global Aid Plan that emphasizes economic and environmental justice. Based on efforts such as the Sustainable Development Goals, what efforts and goals must be included in this aid plan to assure the achievement of ecological security? Who should administer it? How might we hold individuals, governments, and corporations accountable? Creative action will be required to change the status quo. Given how difficult it is to change individual behaviors and patterns of consumption related to the environment, confronting the militaristic mindset that dominates security thinking presents an even more ambitious challenge for the possibility of ecological security. What forms of creative activism might you engage in or design toward challenging the status quo on security? You might want to peruse the videos from #No War 2017 – particularly those sessions related to divestment and creative action (see link below). “#No War 2017: War and the Environment” was held September 22-24 in Washington, D.C.. “#No War” is World Beyond War’s annual conference. Visit the conference website to access resources and videos from the entire conference. In preparation for this discussion watch the introductory video by Kayla DeVault (above) and peruse the additional resources below. Kayla DeVault introduces a critical cultural and colonial lens to ecological security. Ecological security for indigenous peoples has an enormous cultural component. She observes that concepts such as “ecological security” are not widely used on the nation. There is no specific language that captures this term; rather, ecological security is embodied in the culture. Exploitation of indigenous peoples and their resources is made possible because the exploiters operate from different paradigms and have different sets of values. How might we confront or bridge cultural differences and differences of values as they pertain to ecological security? What aspects of ecological security might we adopt from indigenous communities into Western approaches? How has our thinking about security become colonized? How might we go about decolonizing our minds as it relates to peace and security? “Women, Indigenous People, the poor of all nations, and people of color bear the most dramatic burdens of climate change and, to date, have struggled to have their voices heard and had the least amount of power to impact climate policy.” The Women’s International League for Peace and Freedom outlines the links between climate justice, women and peace (see resource link below) that are in many ways similar to the links between climate justice, indigenous communities, and peace. What must be learned and understood about women’s experience of the world if we are to effectively pursue ecological security? As part of a process of decolonizing our minds, Kayla observes how important it is to reframe the situation and to seek the truth from the source. She encourages us to engage with grassroots indigenous activists to learn and understand how we got here and how we might change our situation. Consider getting engaged with or providing support to local or nearby indigenous communities and activists, such as those that assembled at Standing Rock. Don’t propose solutions to their problems, rather, listen deeply to truly understand their experience and reality. Reflect on these conversations to see how they challenge your perspectives. How Are Climate Justice, Women and Peace Interconnected? Women’s International League for Peace and Freedom.